Supper preparation started late tonight. This slaw took a mere 10 minutes and was different than anything tasted before, still slaw, but different somehow. And good! The defining ingredients were the sherry and the peanut oil though substitutes of course would work. Whisk together dressing ingredients. Stir the cabbage into the dressing, about a third at a time. (see ALANNA's TIPS) Chop the pepper and onion and stir in. Season to taste with salt and pepper. If you're making this in advance, you can stir in the cabbage, pepper and onion at the same time. 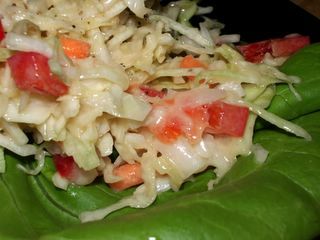 Starting early, however, helps the flavors begin to meld, a small head start, no doubt, but I think it made the salad very good in 10 minutes -- even if I suspect it'd be delicious in an hour.